Sweet, tangy, and better than anything you'll get in a bottle! Blueberry balsamic vinaigrette salad dressing is sweet and tangy, and made with fresh blueberries. 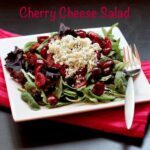 Forget the bottled stuff and add a burst of flavor to any salad with this easy gluten-free salad dressing recipe. Who is ready for apples and pumpkin? Craving pears and butternut squash? So, yeah, I’m totally not. Which really makes me a terrible food blogger. Maybe it’s because you can get yummy apples for a pretty large portion of the year, and unless you are way more ambitious than I am, pumpkin comes from a can. But peaches, corn, blueberries, watermelon, tomatoes? Only good for about the blink of an eye. And honestly I don’t think I’ve had my fill yet. My food blogger friends, though? They’ve be cooking and baking with those fall flavors for weeks! And they’re all posting those new recipes already! I just can’t. Not yet. There are still blueberries to be eaten, and Blueberry Balsamic Vinaigrette Salad Dressing is a super yummy way to do that. Even if you have some berries that are starting to get a little squishy, since you’re just gonna toss them into a blender with a few ingredients to make a super simple, super yummy salad dressing that is a little sweet, nice and tangy will add a tremendous pop of flavor to your salad. I’ve used both honey and maple syrup in this dressing and it is fabulous either way, so you can totally make this dressing paleo or vegan. 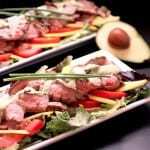 And it even makes a great marinade for chicken, like on this salad. I feel like a blog-powered time machine. Regardless, make sure you check out the recipes at the bottom of this post! Then go enjoy a few more summer meals with this Blueberry Balsamic Vinaigrette Salad Dressing on them! Are you ready for fall flavors, or still savoring the last tastes of summer? Combine the ingredients in a blender or food processor and puree until smooth. Season to taste with salt and pepper. Store in the refrigerator. Plus make sure you check out this week’s #SundaySupper Labor Day menu! I don’t do any canning, so no, I haven’t tried to can the salad dressing. I have tried the balsam with chicken wings. Tasty! I’m happy to hear that you enjoyed the blueberry balsamic vinaigrette recipe! I picked your recipe because there is no thyme in it. I substituted cranberry sauce and it tadtes delicious. Thank you for your recipe and your effort. So glad that you enjoyed the recipe, Vicki! Blueberries are really delicious! And this salad dressing is such a great idea to have a twist of it. Just looking at the photos, you can tell that it is delicious and mouth satisfying. This looks so tasty! Thanks so much for linking up on Cook it! Craft it! Share it last week – you’re being featured! Come check it out!! Such a gorgeous vinaigrette! Love it! I love blueberries, haven’t tried using them in a dressing though. Nice way to use summer’s bounty! The blend up so smooth and add such great flavor! I’ve made this dressing a number of times!